I have to tell you that this was the very first time I ever attempted to make a stuffed pepper. The next thing I have to tell you is that this is the most amazing stuffed pepper recipe I have ever had the pleasure of placing into my mouth! It turned out crazy delicious. 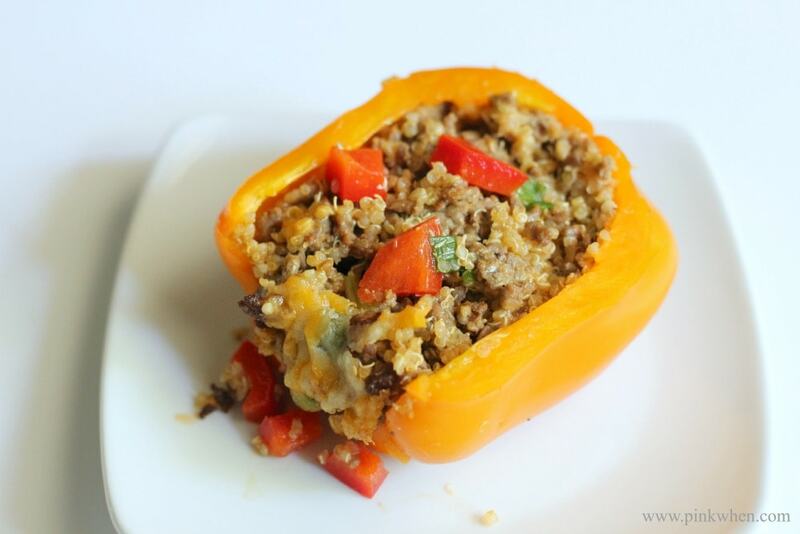 Check out how easy this spicy and delicious chorizo and beef quinoa stuffed pepper recipe is. It has a little bit of everything, and it is AMAZING. When I had the idea of making a stuffed pepper recipe, I wanted it to be a one of a kind original. In fact, you are seeing this here first! I had the pleasure of making this recipe purely from an idea, and it just so happened that it turned out crazy delicious. It’s funny how certain things inspire you, and I have always cooked with inspiration. 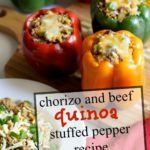 These chorizo, beef, and quinoa stuffed peppers came about when I took a longer than expected trip to the grocery store, and just happened to be craving stuffed peppers. Check out how I created them. The first thing you will want to do is heat the oven to 350, boil the water for the quinoa, and in a separate skillet brown the beef and chorizo together. Drain the meat mixture well, and then place into a medium mixing bowl. 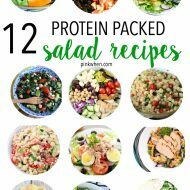 Once your quinoa is fully cooked, add it to the mixing bowl. Add the green onion tops, cumin, cayenne, chili powder, and monterrey jack and cheddar cheese. Mix well. Cut the tops from your bell peppers and scoop out any remaining seeds. Then take your meat mixture and start stuffing the bell peppers until they are full. 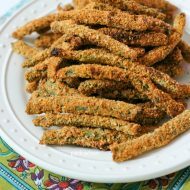 Sprinkle with a little cheese and then bake in the oven for about 10 minutes until the bell pepper has softened. Serve immediately. 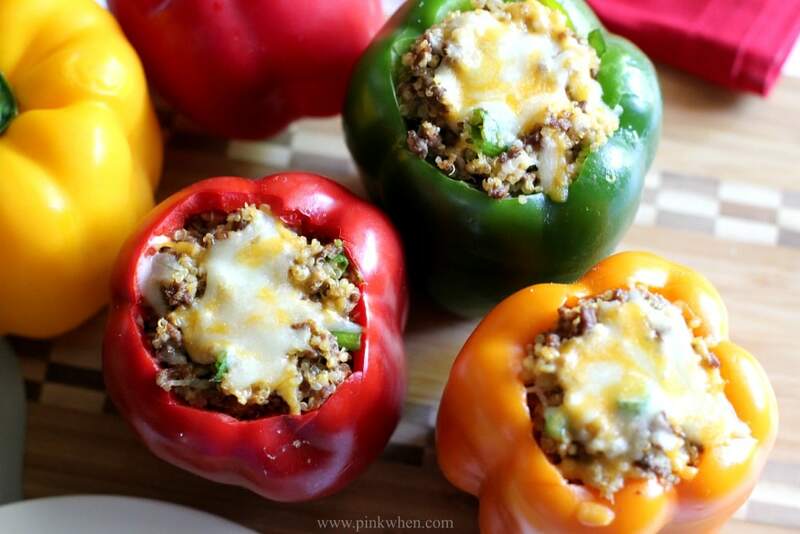 An original recipe from PinkWhen, this chorizo, beef, and quinoa stuffed pepper recipe is downright AMAZING. 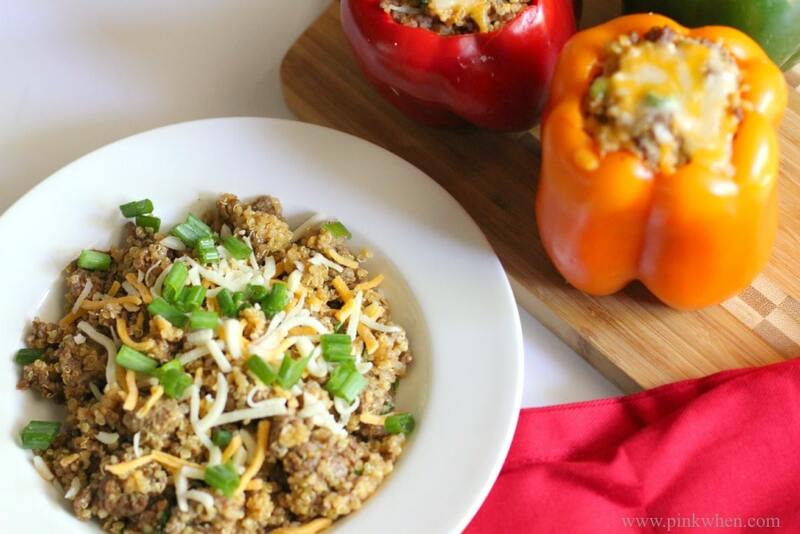 In fact, this chorizo and beef quinoa mixture is so delicious, you can eat it all by itself. It’s so tasty, you will be hooked! 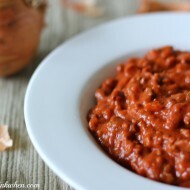 I love modifying and creating recipes, but this has to be one of my all time tasty creations. 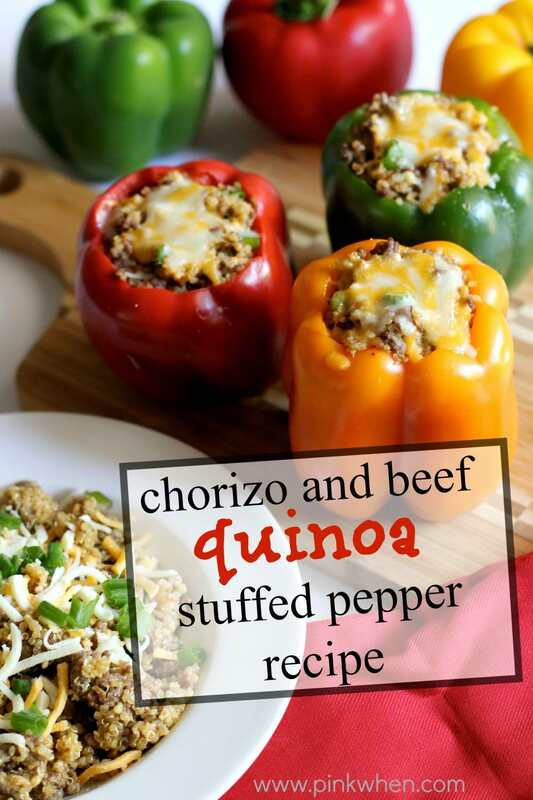 Give it a try, and leave a comment on what you thought of these chorizo and beef quinoa stuffed peppers. Did you try the meat mixture in the pepper, or did you eat it all by itself?